They say if you put lipstick on a pig, it's still a pig. Well, if you put lipstick on an already good-looking woman, she becomes . . . I don't know, better looking? Either way, The Moto-9 from Bell did not need any improvements, but a new coat of paint definitely doesn't hurt. The new Bell Moto-9 Spark Helmet graphic will definitely start a fire. See what I did there? The Bell Moto-9 Spark retains all of the much-loved features of the original Moto-9, including a lightweight shell, excellent ventilation, magnetic cheek pads, and a removable X-Static silver liner. What you get is a shiny new coat of paint complete with stark and aggressive lines. It screams "awesome," but isn't overly chaotic or busy. There are two versions, one Black / White / Red and another Black / Orange / Blue. You can get your favorite color, as long as it's one of those. 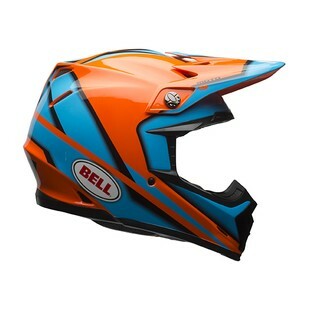 If you've been in the market for one of the latest-and-greatest dirt helmets, but solid colors make you snore and everything else isn't worth your time, consider the Bell Moto-9 Spark. It's loud and aggressive, but purposeful. It'll make a great addition to any rider's helmet rack.